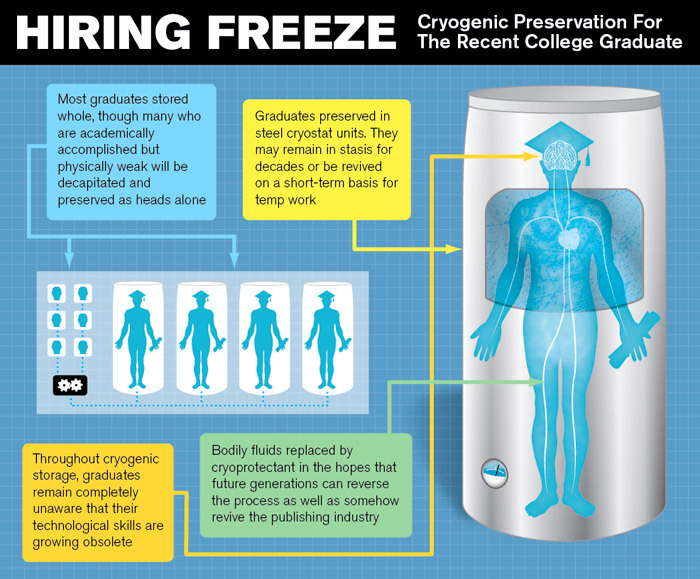 In a bold new measure intended to address unemployment among young professionals, lawmakers from across the political spectrum agreed on legislation Tuesday to subsidize the cryogenic freezing of recent college graduates until the job market recovers. . . . The Frozen For Their Future Act reportedly calls for the installation of thousands of cryogenic tanks at college commencement ceremonies around the country. Upon receiving their diplomas, newly minted graduates will immediately make their way to preservation stations where their hearts will be artificially stopped using electroshock or a potassium-salt solution. Once a graduate’s blood is drained and replenished with an anti-crystallizing fluid, they will be submerged in liquid nitrogen, a process that will, in effect, put them into suspended animation until key sectors of the American economy such as real estate and information technology have rebounded. Posted by Zach in Internet, Jobs, Non-Wesleyan, Random and tagged Job market, Jobs, satire, the onion on March 15, 2010 at 9:29 PM.